Mayweather vs. Canelo: Will Saul’s 20 lb. weight advantage help him beat Floyd? 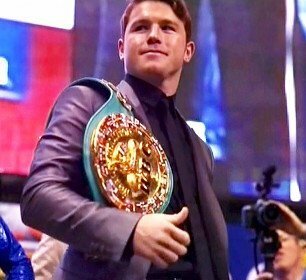 Golden Boy Promotions has done a good job of parking their fighter Saul “Canelo” Alvarez (42-0-1, 30’s) in the junior middleweight division instead of at middleweight, which is where the 172 lb. Canelo should be fighting given his weight. But by parking Canelo at a weight that he’s barely making at 154, Canelo has big advantage over the welterweights that Golden Boy is matching against him. I’m not talking junior middleweights because Golden Boy has been mainly matching Canelo up with pumped up welterweights. The exception to that was Canelo’s fights against Austin Trout and Ryan Rhodes, but the Trout fight was a very close one and probably should have been scored a draw, if not a victory for Trout in my view. Canelo came into his last fight in April weighing 172. His fans say that it was just a one-time thing for Canelo to weigh 172, and that he usually fights in the upper 160s, close to 170. I can’t see the difference between 168 and 172. It’s still pretty much a 170 pound fighter facing the 150 pound Mayweather on fight night. If Canelo is going to win this fight he’s going to win it by that big size advantage not because he’s faster, has better stamina, is busier or is a better boxer than Mayweather because Canelo is none of those things. He’s not faster than Mayweather, his stamina is really lacking to the extreme, he’s not busier than Mayweather and he definitely isn’t a better boxer than him. The only thing that Canelo has in his advantage in this fight is his weight. He’s a middleweight fighting at junior middleweight against welterweights. That’s a mouthful but that’s pretty much what the reality. He’s not fighting guys his own weight like Gennady Golovkin and I have serious doubts that Golden Boy will let Canelo fight Golovkin until Golovkin is showing signs of serious age and decline. At that point, I can see Golden Boy finally letting Canelo fight him, perhaps in another fight with open scoring in Texas like Canelo’s last fight with Trout. The September 14th fight will come down to whether Canelo’s 20 pound weight advantage will be enough for him to beat Mayweather. If Canelo’s can’t overpower Mayweather with his size or knock him out, I think it’s going to be tough for him to get the ‘W’. I can’t see the judges giving Canelo rounds against Mayweather based on Canelo landing the harder shots but getting outworked. That was the case against Trout, but I don’t see the next judges ignoring the fact that Mayweather fighting hard for three minutes, while Canelo is doing 1 minute of hard work and mainly just sitting back and looking to land an occasional hard shot. You are here: Home / Boxing News / Mayweather vs. Canelo: Will Saul’s 20 lb. weight advantage help him beat Floyd?